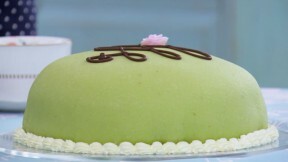 This princess cake recipe appeared as the technical challenge on the Continental Cake episode of The Great British Baking Show. For the vanilla custard, pour the milk into a pan with the vanilla seeds and vanilla pod and place over a low heat until just simmering. Remove from the heat. In a large bowl, whisk the egg yolks, sugar and cornflour together until pale and creamy. For the jam, tip the raspberries into a deep saucepan with the sugar and two tablespoons of water. Cook gently over a low heat, stirring occasionally, until the sugar is dissolved. Bring the mixture to the boil and boil vigorously for about four minutes, or until the temperature reaches 104C/219F on a sugar thermometer. Transfer to a heatproof bowl and leave to cool completely. For the sponge, preheat the oven to 180C/160C(fan)/Gas 4. Grease and line the base of a 23cm (9 in) springform tin with baking parchment. Sift the cornflour, flour and baking powder over the egg mixture and carefully fold in using a large metal spoon. Fold in the melted butter, taking care not to over mix. Dust two small pieces of greaseproof paper with icing sugar and one by one, place the balls of fondant between the sheets of greaseproof and flatten each ball out with your fingers, to a thin circle, approximately 2cm/1in in diameter. These form the petals. Roll the first petal up like a sausage to form a bud and wrap the remaining petals around the bud to make a rose. Bend and curl the edges of the petals, to make them look more realistic. Leave to dry for at least an hour. In a bowl, whip 600ml/20fl oz of the double cream to firm peaks. Fold half of the whipped cream into the remaining custard. Knead in the bowl until it forms a stiff dough. Turn out onto a surface dusted with icing sugar. Using a cocktail stick add a tiny amount of green food coloring and knead to an even pastel green color. Whip the remaining 150ml/5½fl oz of cream to medium peaks and spoon into a piping bag fitted with a small star nozzle. Pipe around the base of the cake. Spoon the melted chocolate into a small paper piping bag. Snip off the end and pipe a swirl over the top of the cake. Top with the fondant rose.